Sure, Bellator MMA might have gobbled up several former UFC fighters – including two past their prime prior light heavyweight champions in Quinton “Rampage” Jackson and Tito Ortiz, a habitual marijuana smoker who can’t decide if he wants to retire or not in Matt Riddle and a testosterone abuser in Lavar Johnson – but they want nothing to do with Rousimar Palhares (pictured) and his dirty ways. TMZ.com managed to pry themselves away from the Odom/Kardashian/Jenner drama for a brief moment to chop it up with Bellator CEO Bjorn Rebney. When asked if they would now pursue the unemployed jiu jitsu specialist who’s notorious for cranking ankles after his opponents have already submitted, Rebney claims he’s not interested. Just in case you missed it, Palhares submitted Mike Pierce with a heel hook in merely 31 seconds on Wednesday at UFC Fight Night 29. However, after Pierce surrendered and the referee came crashing in to stop the fight, Palhares continue to twist on his ankle for a couple extra ticks. Despite posting the lone tap out on the card, the UFC denied Palhares a $50,000 “Submission of the Night” bonus for “unsportsmanlike conduct.” UFC president Dana White banned him from the promotion less than 24 hours later. Palhares pulled a similar stunt in 2010 when he continued his heel hook attack on Tomasz Drwal after he cried uncle at UFC 111. 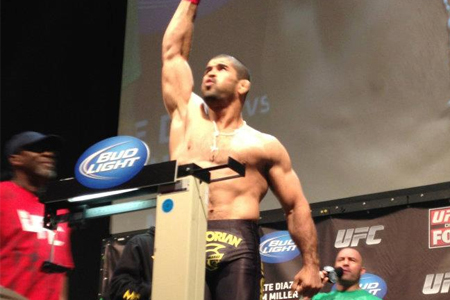 On top of all that, Palhares is fresh off serving a nine-month testosterone suspension. Although he’s arguably the deadliest leg lock assassin in MMA, Palhares appears to be more trouble than he’s worth – even for struggling Bellator.